Traditional instructional design models are based on systems thinking, a paradigm that promotes an analytical mindset. But our work also requires innovation and creativity. Enter design thinking, a human-centered, collaborative, and iterative approach for deeply understanding an audience and their challenges in order to generate effective solutions. Note that design thinking shouldn’t replace instructional design. Rather, it can enhance ID techniques. Being a creative design model, there are many ways to interpret design thinking. One of the original approaches taught by Stanford’s d.school can fit in well with many instructional design models. It consists of five phases or steps: empathize, define, ideate, prototype, and test. Let’s look more closely at each phase. Field research: Observe and talk to potential learners in their jobs. Imagine what it would be like to have that job, and discover problems that may not be obvious. Interviews: Speak with both managers and staff to clearly understand the issues they face and the characteristics of the people you are trying to help. Focus groups: Conduct small group research to explore and understand the attitudes of audience members. Try to discover their values and beliefs. Get to know what motivates and demotivates them. Ineffective training solutions are often based on an incorrect understanding of the problem. In the design thinking approach, it is important to accurately define the problem at hand. If we spend sufficient time and effort at this task, we may discover that training is not the solution at all. That’s why defining the problem through research—looking at it from many angles and perspectives—can set you on the right track. Without correctly defining a problem, it’s nearly impossible to generate a corresponding solution. The practice of conceiving ideas (sometimes called ideation) is a critical step of design thinking. Ideally, this is when a cross-disciplinary team generates potential solutions to the problem defined during research. This may even involve collaborating and co-designing with the audience. Brainstorm with sticky notes: Team members write potential solutions on sticky notes and post them on a board or wall. The process of writing and posting continues until no ideas remain or until an agreed upon time runs out. This approach is more anonymous than brainstorming, as everyone is busy writing and posting. At the end, the team organizes the sticky notes into logical groups and discusses all the ideas. Sketch: For many people, sketching ideas is a way to short-circuit the judgement side of the brain. Sketching can help you tap into a flow of ideas. Using stick figures and geometric shapes is completely acceptable and gets the job done. Consider this practice visual brainstorming. Use manipulative verbs: Brainstorming creator Alex Osborn suggests using a list of action verbs when working through ideas and problems. Simply create a long list of verbs and see what new ideas are generated from this approach. Create mind maps: Mind maps, which are radiant drawings showing connected ideas, are good for exploring many sides to a problem. Build these alone or with a team to generate new ideas. Sketches: Using pencil and paper or a digital drawing tool, storyboard a scenario or visualize all possible responses to an interaction. Mock-ups: A mock-up is a simulated version of an idea that replicates how it will look and behave. These can range from a Styrofoam model to a working user interface of an online learning experience. Small implementation: If your idea involves something that isn’t physical, such as social learning, then your prototype would involve building a very small and rough implementation of the approach that would work for a small group of people. Design thinking is an iterative process that involves lots of testing and modification. Testing is all about seeing what works in the real world, getting feedback, and refining (or ditching) prototypes. For this process to work, be sure to test your innovative solutions with the target population through all of its iterations. 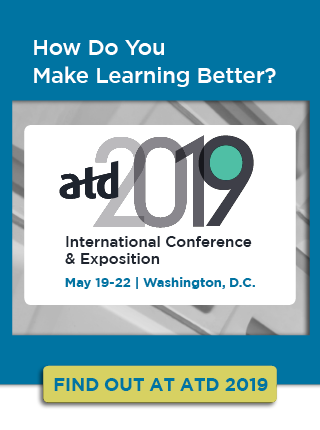 For a deeper dive into this approach, join my preconference workshop Using Design Thinking to Craft Learning Experiences at the ATD International Conference & Exposition this May in Washington, D.C.! Empathize is sharing the feelings of the audience. But they are a diverse group with different feelings. Field research, interviews and focus groups are steps in the qualitative analysis. Then I have to quantify the percentages of the training audience to which these findings apply. Defining the problems means defining it for different employees in the same position. After that ideate (design), prototype (develop), and test (evaluate) seems like ADDIE without implement. Excellent read. This prompts me to learn more about how these ideas activate different parts of the brain that aren't ordinarily used in a corporate setting, e.g., sketching/art-related activities. A succinct reminder of a more creative way of designing instruction!